How to add selected row from one gridview to another gridview? 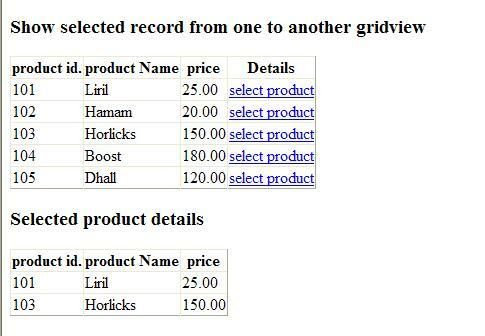 In this article, I am going to explain about how to add selected product row from one Gridview to another. This concept is use many times in shopping cart projects. If user is added product in his/her shopping cart then finally need to show selected product in separate grid. In many f shopping cart website we are select product in the grid view we need to keep that values. Using below concept to add that product in separate gridview. I have placed two gridview controls one for show all product details and other one is used to show selected product details. &LT;asp:GridView ID="GridView1" runat="server" DataKeyNames="pid" AutoGenerateColumns="false"
&LT;asp:LinkButton ID="lnkDet" CommandName="cmdBind" CommandArgument="&LT;%# ((GridViewRow) Container).RowIndex %&GT;"
ConclusionI hope that this code snippet helps you to know about copy selected product details from one another gridview. Can you tell me how the child grid can be displayed as the row of the main grid under the selected row? Thank you so much Ravindran sir. for this thing i was suffering from last month.